Level 30: Our powers are over 10,000!!!1! So the devs dropped by the forums to note their plans to bring level 30 to our worlds. If you haven’t caught it, start with this thread from Vargouille. Then there are new feats. At level 29 you get a new Epic Destiny Feat slot, which require 3 capped destinies but also give you a series of new feat types. These can be found here. Activate to pop off to the land of dreams. You are invulnerable and invisible for five seconds, then return with a random 30-second buff. 1 minute cooldown. With weapon and unarmed attacks, deal 1d20 Bane damage against all targets and an additional 2d20 Chaos damage against Lawful targets. This scales with Melee or Ranged power depending on your weapons. These aren’t bad at all for Monks and adaptable to my Zen bow builds, too. By level 30, you get a Heroic feat slot–a welcome bonus as often builds have to sacrifice that one feat at level 18 you can attain now. And there’s a new set of feats called Legendary Feats, listed here. Permanent Blur, and while sneaking, permanent Displacement. I’m so interested in the Scion of the Ethereal Plane feat. The devs like stealth! They really, really do! There are updated feats for lower level Epic characters, too. I’m still unsure what, if any, of these are directly applicable to any kind of Monk at the moment. And cheers to the PRR and MRR bonuses for Epic hirelings. Combined with Harper Agent and Primal Avatar builds, you could make a strong tanker out of some hirelings–provided they don’t wander off or lose focus on the fight. Knowing how swiftly we got the Doubleshot changes from Update 28, I suspect these ideas will be our Christmas present under the update tree, all before the end of the year. What’cha think about them? I’m interested mostly on monastic applications, as is the focus of this blog, so fire away. A revisit to an old idea but with a bit more spice. Now that I understand more on how to perfect a simple non-Ranger archer, it’s time to answer the other side of the question. 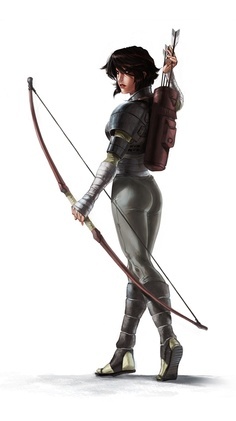 The Zen Archer excels in sniper shooting combined with high miss-chance defenses, evasion and spell resistance. To make all that work, she can’t call a lot of attention to herself, but especially not in melee fights. The recent Update 28 Patch 1 has actually improved the overall Ranged Power of the Zen Archer because of the changes to Ten Thousand Stars. (That is, at least I think so.) I may make a variation where WIS is higher than DEX since Ranged Power is greatly increased with TTS. But I digress. It’s time to create a more aggressive Monk Archer, or “monkcher.” One that stays a pure Monk (and thus maximizes the benefits of TTS) but, unlike the Zen Archer, sacrifices a bit of defense for Doubleshot bonuses as well as high damage over multiple targets. An archer build that is designed to attack first and count the bodies later. I’ve tried this before with Pynthetica a while back and didn’t get a lot of traction because I neglected to research how bow damage is calculated. It will be an Elf as well to use DEX to damage. However, WIS is boosted to give more Ranged Power and attack bonus for as long as she can spam TTS. That’s particularly important since Action Points will be at a premium in such a build and can’t be used to get Ranged Power elsewhere. The Elf side needs 20 points or so to complete the Aerenal Weapon Training, Aerenal Grace (DEX-to-Damage for bows), Skill (3% Doubleshot), a point into Arcanum (some MP) and then 4 AP to activate the Elven Arcane Archer tree. Most of the AP in the AA tree go into the things you’d expect. Since the Elf AA tree levels slowly, with the last two core abilities not available until levels 22 and 25, I have to reserve AP until those last cores are available, especially Master of Imbuement for 20% additional Doubleshot. This will go with any Enhancement bonuses from gear (the heroic and epic Dynamistic Quiver come to mind) and the Epic Destiny feat of Doubleshot for 10% more. So, by level 28 I will have at least 5% (Skill and 2% guild ship buff) with Shadow Arrows (5%) and Master of Imbuement (20%) for a standing 30% Doubleshot, not counting any item Enhancements. The Epic Destiny feat gives 20% 10% at level 28 for a total standing 50% 40% Doubleshot without item Enhancements. The magic is added with Ten Thousand Stars as it adds (Monk level x 5) to Doubleshot for 30 seconds. At level 28, that’s 140% 100% additional Doubleshot for a total of 140% Doubleshot. That’s a 80% chance to shoot an additional arrow on every attack in addition to the usual additional arrow. Ranged Power also goes through the roof, The higher the WIS, the more Ranged Power appears to boost overall damage. The Bowmaster has to forsake the bonus features that the Zen Archer favored from the Harper Agent tree and most of the Ninja Spy tree. Although this Monk is aligned as a dark Monk like the Zen Archer, it simply won’t have enough AP to add more than a few points into Ninja Spy to train Stealthy for +1 passive ki regeneration and Acrobatic for some Dodge, perhaps. Shadow Veil, 25% Incorporeality, is too expensive, so Ghostly items may be the best the Bowmaster can do. They’ll be lots more Ranged Power from TTS than what I could manage from Harper Agent, in any case. Next to Shadow Veil, I’ll miss the Ninja Spy’s 30% extra damage from No Mercy. The Bowmaster might have some stealth, but I don’t think it’s her calling. Perhaps I may experiment with Use Magic Device. I might, just might, be able to get enough UMD to use Heal scrolls with points and the right items. Others have done it, so all I need to do is emulate what’s been done. That first change from my initial tooling in Character Builder Lite was to have at least 10 CHA and get a +5 Tome for that ability to aid in UMD. That, and rip all skill points from Hide and Move Silently. I could also add in an INT tome for one or two more skill points to add to UMD, of course. She’s going to need that healing. The Bowmaster, with Improved Precise Shot often active, is a berserker like her monkcher brethren. She’ll use her AA powers to punch through and heavily damage the hordes. She won’t be still at all like her counterpart Zen Archer except in the basic monastic defenses and movement speed, as well as benefits from Earth Stance and Ocean Stance to critical threat range and passive ki regeneration, respectively. Perhaps I can work in Shot on the Run for a bit more Ranged Power and remove any movement-based attack penalties. The feats should be similar to the Zen Archer except: No Dragonmarks for eventual use of Displacement; Improved Precise Shot is added. Deflect Arrows may be optional in favor of Dodge or a feat to help with UMD. I also mentioned considering Shot on the Run. Here’s the preliminary build for those interested. Comments welcome. I won’t be adding this one up for “discussion” on the DDO forums for now, at least until I get it working. I’m confident that you don’t need to spray levels in non-Monk classes to get the most out of a Monk archer. Like everything else I tend to build, I believe you simply need more monastic cowbell. More to come as I move Paracleta, this Arcane Archer Monk version 2, through her paces.